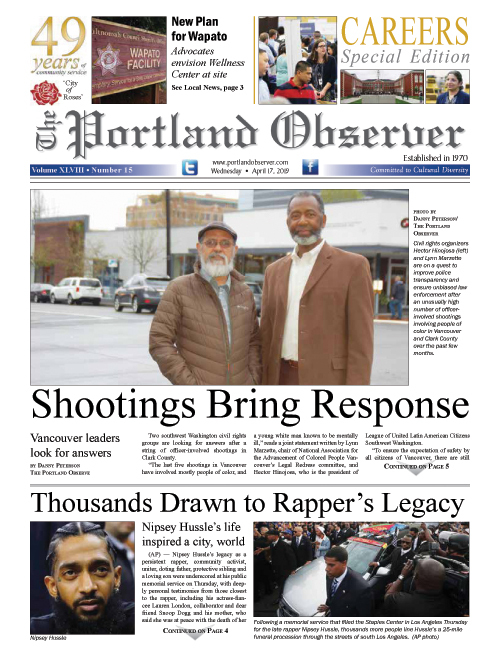 Cervante Pope | 6/21/2016, 4:03 p.m.
A rally to save the Oak Leaf Mobile Home Park serving low income residents in the heart of northeast Portland’s Cully neighborhood and a face-to-face meeting with city commissioners at City Hall has given residents of the park a bit more promise for a solution to keep their homes. A new excise tax on city development is up for vote by the City Council this week and if it passes, some of that money could go towards helping the Oak Leaf residents in purchasing the property as a collective to keep their homes. The tax is proposed as a means to raise money to build and retain affordable housing in the city, a collection of revenue made legal by the Oregon Legislature earlier this year with the support of all of Portland’s council members. Renae Corbett, a resident of the Oak Leaf Mobile Home Park, is cautiously optimistic. “We’re not the only people that want some of the money from this proposed tax, so the mayor may be very earnest and true to his word but he’s not the only cog in this wheel,” says Corbett, who has been living at Oak Leaf for two years with her 80-year-old father after spending eight months living in her truck. The owner of Oak Leaf has reportedly agreed to sell the park to the Community and Shelter Assistance Corp. (CASA), who would be purchasing the property on behalf of the park residents as a non-profit group, with additional revenues from the excise tax to make the transaction complete. In addition to following CASA’s lead, Corbett says the residents have been making an effort to clean the park up and make it more presentable aesthetically and socially. A single mother of two, Rhonda Polk has been Corbett’s neighbor at the park for over a year and feels the negative connotation that comes with trailer parks fuels naysayers, and hopes that tidying up the park will help save it. “It doesn’t matter if you’re paying $1,300 or you’re paying $500, every place is going to have a negative point. Our thing is we’re trying to give people a better image of this park. Let us start here to show that not all these places are bad,” Polk says. Oak Leaf is its own little community in the community, a sentiment Polk had to learn herself, after a divorce left her and her two teenage boys, ages 13 and 14, with no other option for housing. “I had the same image in my head as everyone else. I thought ‘it’s a trailer park, I don’t ever want to be there; I don’t even want to walk in there.’ But when it came to a point where I had to go there, I really needed to humble myself, because these people have roofs over their head, they’re paying their rent, they can afford it, and where was I at?” says Polk. An estimated $1.5 million would be needed to keep the park and while it seems like a lot, both Polk and Corbett feel it’s a small price to pay. “They gave Right 2 Dream a $7 million lot and support services for roughly 100 people. I’m glad they gave it to them, that community needed that assistance. But we’re a community of like size that’s asking for a fraction of that cost,” says Corbett. “Considering how much it’d save the city, it’s really not a lot to ask. The outcome of it could be amazing,” says Polk, who says the park has around 60 residents of families, senior citizens and vets that mostly require some type of government assistance. Both women expressed having no idea what’s to come next for them if the proposed tax doesn’t go through, other than homelessness. A plan B to help save the park has not been established.